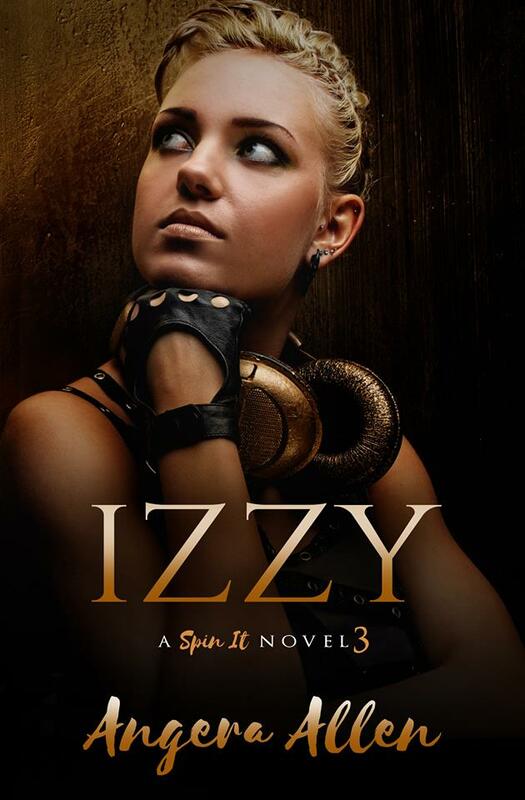 IZZY, Spin It book three, by Angera Allen is LIVE!! Working for Lucas “Luc” Mancini’s record label is not for the faint of heart. Their lives are fast paced and filled with music, mayham and hot men. Isabella Rogers, aka DJ Izzy, is an unstoppable, wealthy California girl living her dream in NY’s underground music scene. Full of energy with not a care in the world, her wild hair matches her electric personality that blares through the music she mixes. Addicted to bad boys, Izzy finds herself in the clutches of dangerously domineering DJ Dominic. When tragedy hit the girls of Spin It Inc., and all hell breaks loose, she turns to her bodyguard Aengus ‘Gus’ Stone for help. Their volatile love/hate relationship explodes and leaves her questioning whether or not he really wants her, or if he’s just doing his job. The mayhem that transpires in this installment of the Women of Spin It, Inc will have you on the edge of your seat! Crazy, outgoing, adventurous, full of energy and talks faster than an auctioneer with a heart as big as the ocean… that is Angera. A born and raised California native, Angera is currently living and working in the Bay Area. Mom of a smart and sassy little girl, an English bulldog, two Siamese Cats and a fish named Red. She spends her days running a successful law firm but in her spare time enjoys writing, reading, dancing, playing softball, spending time with family and making friends wherever she goes. She started writing after the birth of her daughter in 2012 and hasn’t been able to turn the voices off yet. The Spin It series is inspired by the several years Angera spent married into the world of underground music and her undeniable love of dirty and gritty romance novels.